Will The Rich And Poor In Delhi Vote Alike? 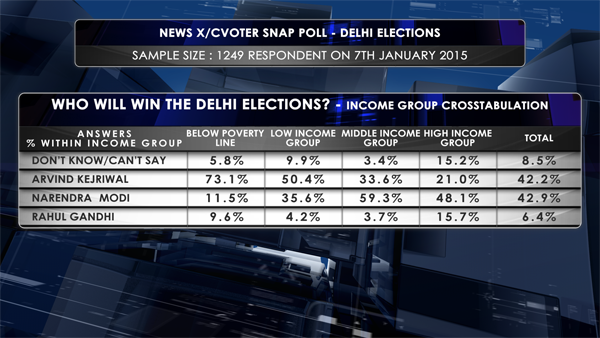 The CVoter Foundation, in association with NewsX, conducted a snap poll on 7th January, 2015 across four different income demographics in Delhi. How will these different socio-economic sections vote in the upcoming elections? 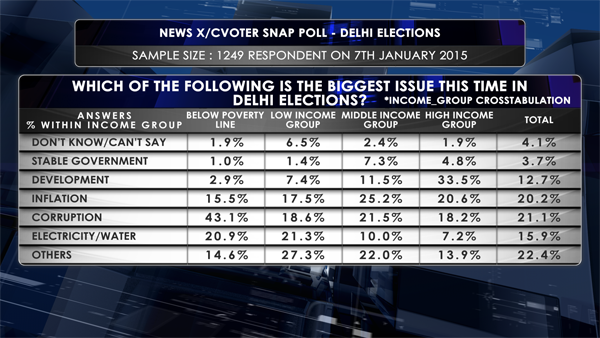 The snap poll featured ten questions and had a sample size of 1,249 respondents in Delhi-NCR. The Delhi assembly elections will finally be held on 7th February, just a week ahead of the scheduled termination of President’s rule. The results will be out on 10th February. “The Indian media is only keen to analyse data from religion and caste equations. In a metropolitan city like Delhi, the caste and religion lines get blurred over economic classes. We decided to see if we can get any substantial findings, in terms of socio-economic classifications,” explained Yashwant Deshmukh, the Managing Director and Editor of CVoter Foundation. 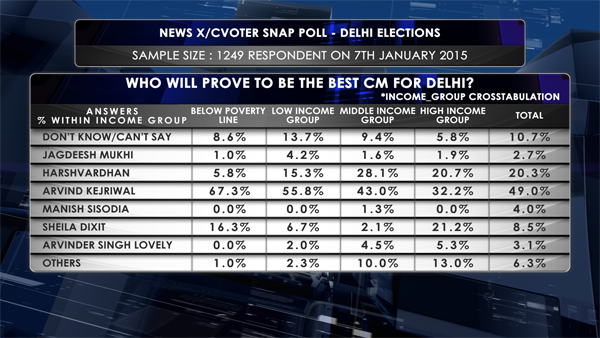 The polls found that the below-poverty-line (BPL) and low-income groups clearly favour Arvind Kejriwal over Narendra Modi and Rahul Gandhi. Indian PM Modi was backed by majority of the middle-class and high-income sections. “This is entirely new. The same numbers from a year ago were completely different. Kejriwal’s lead was largely in the middle-class sections, the BJP’s lead was in the high-income groups and the BPL groups favoured Congress,” Deshmukh said. “It will be the turnout and movement of the BPL and middle-income voters that will decide the fate of the election,” he added. The next question was a straightforward one, asking if the respondents were happy with Kejriwal’s first term in office. “The surprise here is the middle-income group here. 60% of them say that they were satisfied with Kejriwal. Even though BJP manages to get more votes across the middle-class section, this poll indicates that they aren’t anti-AAP. This is the section that the AAP will try to capitalize,” Deshmukh elaborated. 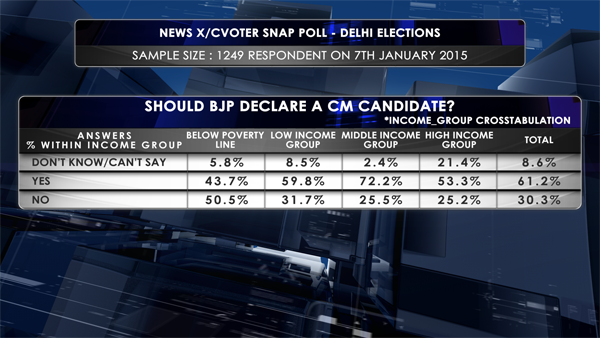 When asked if the BJP should declare a Chief Minister candidate, majority of the people responded in the affirmative. “The BJP core base is hoping for a CM face to be projected. Even among the BPL families, more than 40% are willing to look at a BJP CM candidate,” Deshmukh said. 73% of the people polled from the BPL section said that Modi could be the face of the BJP in the Delhi polls. “It will come down what kind of campaign Modi and his party takes on,” Deshmukh added. “The different socio-economic groups have different priorities. Those from the high-income group focus on development, and not on day-today issues. They want to see Delhi as a world-class city. The biggest issue for the middle-class is inflation. The issues for the low-income and BPL groups largely remain bijli, sadak, paani and daily corruption. This is where Kejriwal scores high. This reaffirms the voting trends that we are currently observing,” Deshmukh explained. The final question was “who would be the best CM for Delhi?” with Arvind Kejriwal, Dr. Harsh Vardhan, Sheila Dikhsit as the options amongst others. “Sheila Dikshit gets higher numbers in the low-income group, which was a Congress core, and also in the high-income group, which is focused on developmental agenda. Interestingly, Kejriwal is scoring high in the low-income as well as the middle-class groups,” he said. “The numbers of Dr Harsh Vardhan in the middle-income group are quite interesting. He is not even in the race nor has he been declared CM candidate. This is something that the BJP could take into account to boost their votes from the middle-class group. He remains the best bet for the BJP,” Deshmukh added.